Stop the insect invasion that’s intent on destroying the textiles in your home. They enter your home in a myriad of ways: hitching rides on cut flowers, clothing, or pets, or simply flying though open windows. 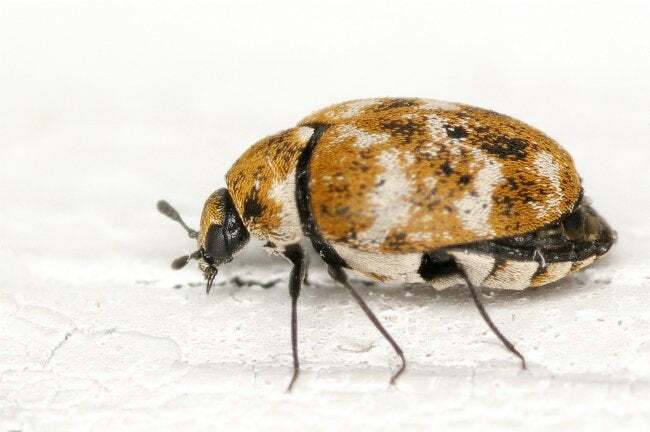 Once inside, carpet beetles (Dermestids) can settle in and lay eggs, and their larvae can really wreak havoc on rugs, curtains, upholstery—even your clothing. Don’t give them a chance to do any real damage. As soon as you spot one of the little buggers, follow this multipronged strategy for how to get rid of carpet beetles fast. In the adult stage, these creepy culprits are less than ¼ inch long and either black or a combination of tan, white, and black. They tend to congregate around windows and doorways—so check these areas if you suspect an infestation. While irksome, the adult carpet beetles are harmless; only in the larva stage are they a threat to natural fibers. The tiny worm-like larvae favor dark areas like closets and behind baseboards, and they’re difficult to spot with the naked eye. Sometimes the only way to know you’ve got ‘em is by the damage they cause, such as bare spots in rugs, holes in packed-away clothing, or wormholes in books. So if you needed an excuse to do spring cleaning, this is it. Spring is the time of year carpet beetles beeline for your home. Since dust bunnies, cobwebs, dead insects and tufts of shed pet fur are an open invitation to larvae, get busy with the duster, vacuum and broom. Next, go through stored clothing to check for damaged or infested items. Laundering kills active larvae but any wool, leather, fur or delicate items that you can’t throw in the washer require professional dry cleaning. The good news is that once you’ve identified their presence, you can usually get rid of carpet beetles without the expense of an exterminator. Vanquish carpet beetles without calling in a pro! 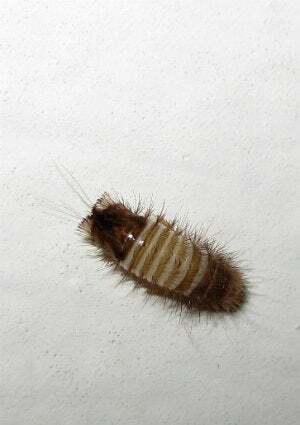 Here are three ways to attack destructive larvae, plus a treatment to get rid of adult carpet beetles for good. Insecticide: Stop an active larvae infestation by treating carpet or upholstery with an insecticide that contains at least one of the following ingredients: deltamethrin, bifenthrin, or cyfluthrin. Test a small inconspicuous area before treating the entire carpet to ensure the product won’t stain. Many insecticides warn against use around people and pets so follow the manufacturer’s safety precautions carefully. Boric acid: Boric acid, which acts as a poison on insect metabolism, is only hazardous to humans if ingested or inhaled in large quantities. Find it at pharmacies and sprinkle it in powder form lightly and evenly on carpet, then use a broom or brush to distribute it into the fibers. Wait several hours and vacuum thoroughly. You may also prepare a larvae-killing spray by adding one tablespoon of boric acid to two cups of hot water and stirring until the powder dissolves. Fill a plastic spray bottle with the solution and mist curtains, upholstery, baseboards, and dark nooks and crannies where carpet beetle larvae hang out. Diatomaceous earth: Another natural product, diatomaceous earth (available at agricultural-feed stores) is a desiccant that quickly kills larvae by dehydrating them. Treat rugs in the method described for boric acid above, and also sprinkle some in the back of cabinets and closets and in pet beds. Choose “food grade” diatomaceous earth, which is safe for pets and humans, but wear a respirator or mask to keep from inhaling the fine dust particles when applying. Fog: Although they’re no longer chewing your possessions, adult female carpet beetles lay eggs and can start the whole nasty process again. Use a flying insect fogger to effectively eradicate adult beetles, and keep flying insect spray on hand to attack any strays or newcomers. The best cure is always an ounce of prevention. Stop adult carpet beetles from entering your home by hanging sticky flypaper strips near windows to catch them. If you find yourself dealing with repeated infestations, place sticky pheromone-type traps on windowsills and in closets to stop carpet beetles before they have a chance to lay eggs.